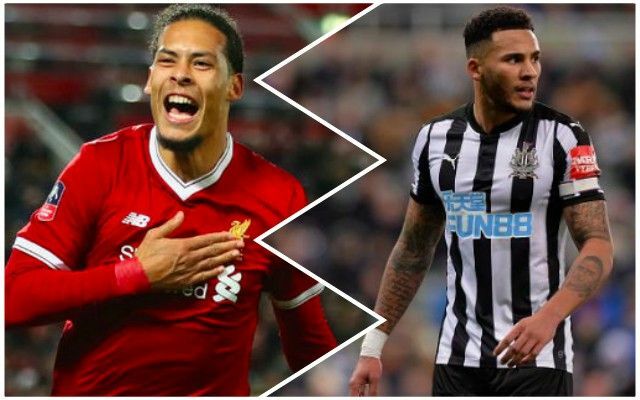 Newcastle captain Jamaal Lascelles has reacted to the news published by Miguel Delaney in the Independent that he’s a top target for Liverpool. The journalist claimed that the 24-year-old is being lined up by Jurgen Klopp, along with Burnley’s James Tarkowski, as a potential arrival to fight for the central defensive spot alongside Virgil van Dijk next season. At the moment, Dejan Lovren plays next to our world-class Dutchman, but although he regularly puts in top performances, there’s always a chance the Croat’s mind can wander and a mistake can cost us a game. Lascelles though doesn’t sound like somebody who’s chomping at the bit to switch from St. James’ Park to Anfield – and his reasons are admirable. “This is the happiest I’ve been,” he told the Shields Gazette. “This is the right club for me at the right time. “We have a huge fanbase, an amazing manager, and this club is massive. It has so much history. We massively respect Lascelles for this interview – especially considering Liverpool are currently are much bigger club and better team than Newcastle – who despite having Rafa Benitez in charge – could battle relegation next term. Tarkowski is an interesting name, too – but in truth – we’re not sure either player is an enormous upgrade on what we already have in Lovren, Joel Matip and Ragnar Klavan. Stick Joe Gomez into that mix and Liverpool are already covered in terms of squad players for one spot alongside van Dijk, who starts every game when fit.